You think I’m kidding. I am now eating my words from the 1990s when I mocked the media for saying that people were going to get “addicted” to the Internet. Here we are, over a decade and a half later, and many of us are compulsively checking our messages – texts, notifications, and other digital communications – all the time. Look around you in a public place. There was a time that a quick view around a café, a park, on an airplane, at a doctor’s office would reveal people in attentive conversation; reading a book, newspaper or magazine; doing some people watching; drifting in a daydream or engaging in a activity totally appropriate for the setting. When I sat down to eat by myself at a restaurant and resisted my own temptation to immerse myself in my smartphone, I saw that every person sitting solo – like me – was looking down at their phones. Nobody made eye contact with anyone else, barely even the waiter. And couples and groups at dinner together? At least one or several in each table were on their phones or stealing glances at their phones instead of looking at the person or people around them. I recently set down my iPhone while on a plane and did a quick visual survey. There were couples sitting side by side throughout the entire flight and never once looked up from their electronic devices or spoke to one another. But there is hope yet for all of us! While we’re currently in a phase of obsessive-compulsive tethering to our electronic communications and those handheld devices that so efficiently connect us to everything, things can change. We can make positive adjustments in our daily information consumption habits and behaviors and untether our lives to get back to living. The first step in overcoming any bad habit (addiction) is to be aware that there is a problem. When you are in a public place, look around and see how others are behaving with their electronic devices. Then turn your attention to yourself and observe how you’re tethered. Call yourself out on it when you mindless reach for your device, not because you need to do something specifically but because it’s there. Be more aware of how distracted you are when you’re immersed in your electronics. Be mindful. Once you are aware, acknowledge the problem – if there is one – and admit that something must change. You have the power to change your habits with self-discipline, but setting up a “buddy system” can also be helpful. Ask someone whom you see on a regular basis to point out when you’re not paying attention because you’re checking your devices. Get input. Let it go. Know that the world will not end if you’re not always accessible. Business will still be there. Colleagues and friends will still be there. Know that everything will be okay without the constant connectivity and checking for messages of any kind. Relax and Breathe. Take small steps to make big changes in how you handle your communications devices. Do remove any electronic devices from your bedroom. Do set up a charger at your door or at your desk and keep them all in one place – away from where you sleep or eat. Do something other than checking your smartphone when you first wake up. Do start your day making and enjoying your breakfast. Do read a newspaper or magazine versus quick hits of digital headline news. Do write something on paper – make notes for the day, even random thoughts, rather than texting or keyboarding. Do pay attention to your food when you’re eating. Do get stretch, get outside, go for a walk. Do visit face-to-face with another person – and pay attention to them. There are many, healthier ways to fill the first hour of your morning rather than tethering yourself to your device. Interrupt this program to power down your devices, get offline, and reconnect with your life and loved ones. Don’t worry. We’ll still be here when you return. 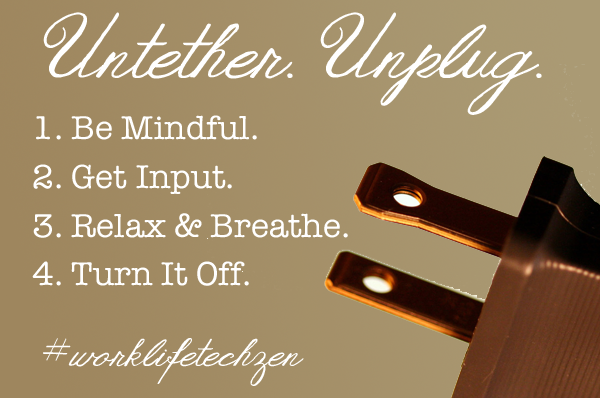 How are you returning to #worklifetechzen?